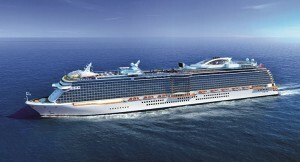 Another 145,000 Royal Class ship for Princess Cruises has been ordered from Fincantieri. By Anne Kalosh, Seatrade – Eleven ocean-going cruise ships valued at a total $6.8bn are targeted for delivery in 2017, according to Seatrade’s orderbook. They’ll add 28,000 lower berths to global capacity. This is similar to 2016, when 10 ocean-going newbuilds arrived, worth a total of nearly $7bn and adding 27,580 lower berths. 2017’s newbuilds are TUI Cruises’ Mein Schiff 6, Star Clippers’ Flying Clipper, Viking Ocean Cruises’ Viking Sky and Viking Sun, Norwegian Cruise Line’s Norwegian Joy, AIDA Cruises’ AIDAperla, Silversea Cruises’ Silver Muse, Princess Cruises’ Majestic Princess, MSC Cruises’ MSC Meraviglia and MSC Seaside, and Dream Cruises’ World Dream. This is an eclectic fleet. It ranges from a near replica of 1911’s France II, the largest square-rigged sailing ship ever built (Flying Clipper) to two very large and different prototype vessels for one brand (MSC Meraviglia, MSC Seaside). Three ships are tailored for Chinese passengers (Norwegian Joy, Majestic Princess, World Dream), and two are for Germans (Mein Schiff 6, AIDAperla). One, for a European owner, is entering service in the US market (MSC Seaside). The year’s ultra-luxury entrant (Silver Muse) is the first newbuild for Silversea since 2009’s Silver Spirit (though the line subsequently built an expedition fleet with extensively renovated pre-owned tonnage). Star Flyer is the first newbuild for Star Clippers in 17 years (the last, Royal Clipper, came in 2000). The ships range in size from 300 lower berths (Flying Clipper) to 4,500 lower berths (MSC Meraviglia), while gross tonnage swings from 8,770 (Flying Clipper) up to 167,600 (MSC Meraviglia). MSC Meraviglia from STX France is the largest ship ever built for a European cruise line, and it will offer features like the first purpose-built venue for Cirque du Soleil. MSC Seaside is a new design, too. It’s been called ‘revolutionary,’ with a 360-degree promenade on Deck 8 that’s lined with indoor/outdoor shops and restaurants, a full buffet area and a pool—features typically located on upper levels, and high-rise hotel towers. It is Fincantieri’s first newbuild for MSC Cruises. Silver Muse kicks off a new class for Silversea, but at 40,700gt with all-suite accommodations for up to 596 passengers, it’s not a huge leap size-wise from the 36,000gt, 540-passenger Silver Spirit of eight years ago. It features a wider array of dining venues (eight). Norwegian Joy is second in the Breakaway Plus series (following 2015’s Norwegian Escape) and is heavily customized for Chinese travelers, with novelties like the first race track at sea. Majestic Princess is third in the Royal class (after Royal Princess and Regal Princess) and its nods to the China market include a Chinese haute cuisine restaurant by a Michelin-star chef. World Dream is the twin of 2016’s Genting Dream. Fincantieri remains the most prolific builder, with five ships (Viking Sky, Viking Sun, Silver Muse, Majestic Princess, MSC Seaside), followed by Meyer Werft with two ships (Norwegian Joy and World Dream). Four other yards will produce one ship each—STX France (MSC Meraviglia), Meyer Turku (Mein Schiff 6), Mitsubishi Heavy Industries (AIDAperla) and Brodosplit (Flying Clipper). The record cruise ship orderbook got a further boost with Fincantieri signing a memorandum of agreement with Carnival Corp. & plc for one new ship each for Holland America Line and Princess Cruises. The order is valued at more than €1bn. The HAL ship will be a third in the 99,500gt Pinnacle class, for delivery in 2021. It will be built at Fincantieri’s Marghera yard. The ship follows 2016’s Koningsdam and its sister, Nieuw Statendam, scheduled for delivery in November 2018. The Princess ship will be sixth in the 145,000gt Royal class. It will be built at Monfalcone for delivery expected in 2022 and feature the recently unveiled Ocean Medallion Class cruising. The vessel follows 2013’s Royal Princess and 2014’s Regal Princess. 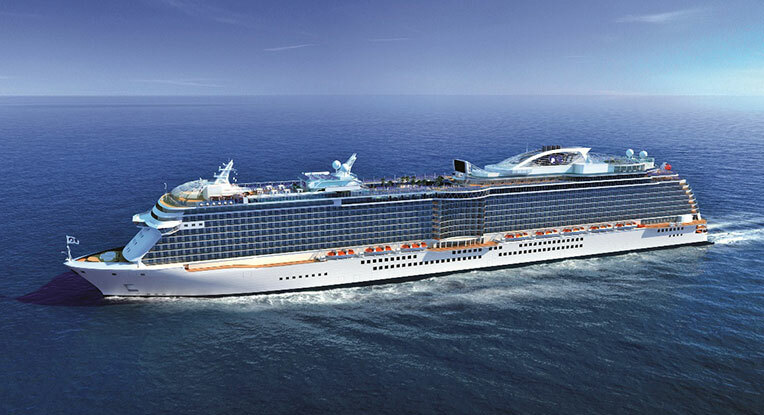 Coming in March for the China market is Majestic Princess, and a further pair of Royal-class sisters is due for handover in 2019 and 2020.